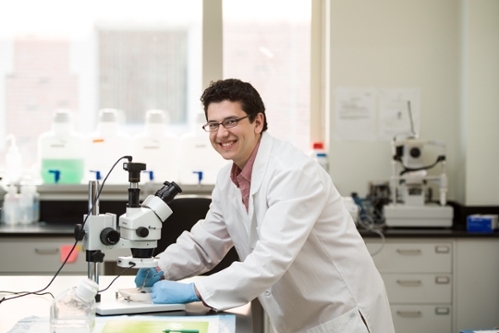 Congratulations to Manuel Ramirez, a graduate student in the lab of Mark Buckley, who was awarded a summer fellowship from the Fight for Sight Foundation. Summer Student Fellowships are available to undergraduates, graduate and medical students who are interested in pursuing eye-related clinical or basic research. FFS occupies a unique niche in the eye research foundation community – its primary mission is to support and encourage promising scientists early in their careers. Fight for Sight (FFS) was founded in 1946 by Mildred Weisenfeld, a young woman with retinitis pigmentosa, to encourage and fund research in ophthalmology, vision and related sciences. The goal of Fight for Sight is to encourage and facilitate research in detection, understanding, prevention, treatment and cures of visual disorders, especially those diseases leading to impaired sight or blindness.